With a legendary career as a hit-making musician, solid-body electric guitar trailblazer, and an inventor of unprecedented recording techniques, he has impacted and influenced the many facets of the music industry like none other. Filmed live at what was then the Gibson Amphitheatre in Los Angeles on February 8, 2006, A Tribute To Les Paul: Live From Universal Studios Hollywood gives viewers a front row seat for an unforgettable night of powerhouse performances, as some of music's biggest names come together to honor the ultimate icon. The night is headlined by show-stopping numbers from an all-star slate of Paul disciples, that includes Slash and Edgar Winter teaming up on the Stevie Wonder staple "Superstition;" Toto axeman Steve Lukather's rendition of Jimi Hendrix's "Little Wing;" and Joe Perry and Buddy Guy closing the night with a soulful blues set. Other highlights include spirited performances by Joe Satriani, Kenny Wayne Shepherd, recent Rock & Roll Hall of Fame inductee Neal Schon, and more. 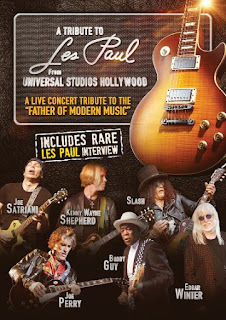 As part of the night's festivities, A Tribute To Les Paul: Live From Universal Studios Hollywood also features rare commentary taken from several of Paul's final interviews recorded at New York's landmark Iridium Jazz Club, as well as at Paul's home in Mahwah, New Jersey. The special event was held to raise funds and awareness for the South Central charity A Place Called Home, designed to give at-risk youth a safe and secure environment they can thrive in. The program is produced by Icon Television Music, Inc., HD Net (now AXSTV), and In Touch Entertainment and distributed by MVD Entertainment Group. The award-winning production team includes Charles Carlini ("Les Paul's 90th Birthday Concert at Carnegie Hall"), Bob Cutarella ("Les Paul & Friends"), Howard Lipp ("Les Paul 90th Birthday Concert at Gibson Amphitheater"), and Glenn Aveni ("Les Paul Chasing Sound"). Michael Braunstein, Executive Director of the Les Paul Foundation stated, "It is without a doubt that Les Paul is the 'Father of Modern Music' and that musicians from every corner of the globe and in every genre of the music industry stand upon his shoulders. He was an inventor, an award-winning musician, an innovator and most importantly a very special man I also had the privilege of calling my friend. The artists and producers who have made this tribute program possible give us every reason to remember that Les Paul was a man who influenced our music industry profoundly. I am thrilled that viewers everywhere will have the chance to witness his greatest through the performances and storytelling of this wonderful program."